Get ready for the fast-paced finale to The Hidden series. Fletcher’s Song rolls out twists in the tale while the action flows. Every unanswered question form Ice Breakers and Sunker's Deep is answered but not until the last possible moment. Crew from the ‘Oyster’ and survivors of the ‘Sunkers’ submersibles lay siege to the citadel where the Devouts are holed up while Petrel and her friends search for the song that will free the world from these dreaded anti-machine Devouts. But the song eludes them. Gwin comes from a long line of Fetchers whose only mission in life is to keep the old songs alive. She and her family roam from village to village singing hope back into people’s lives. They are forever on the run from the Devouts. When her mother dies, Gwin struggles to believe in anything, even the power of family. Could Gwin be the key to the song? I doubt you’ll see the final twist coming. I didn’t. 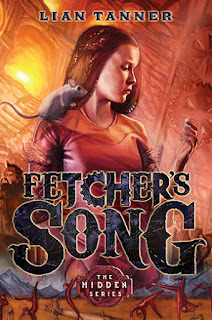 As with all of Lian Tanner’s tales, Fetcher’s Song keeps you intrigued as it takes you on a rollercoaster of action and suspense. The Hidden is one of my all-time favourite series.